Black metal for me has two sides. On the one side there's the bands that prefer image over music and on the other side there's those who prefer to let their music do the talking. That may be a farely generic statement I know, but It's one which I've stuck by since I started digging deeper into the black metal realm. Pseudogod are on the latter side for me. This Russian four-piece formed in 2004, released their first demo in 2006 and after a few split records and other releases, unleashed their debut full-length in 2012 via Hells Headbangers and Finnish label Kvlt Records. 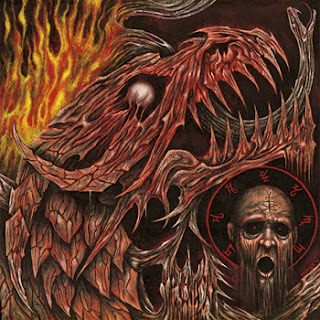 Deathwomb Catechesis features eight hymns full of death infused black metal. I get the impression that Pseudogod approaches their black metal in the same way that many South American bands do, instead of choosing to mimic their Scandinavian cousins. After the choral intro to Vehement Decimation, you're presented with chaotic blackened noise. The drums and guitars seem to be intertwined underneath a strange fuzziness, which gives them a raw sound. The deep growls are more prominent but still sit within the mix a little. That fuzziness in the production seems to detract slightly from Pseudogod’s black metal attack. That fuzziness is less noticeable during Malignant Spears, as Pseudogod's approach becomes more aggressive. Musically they're impressive. They play at a hell of a speed and the drums are especially fraught during their faster moments. They inject some menacing guitar riffs into their mid-paced passages, which give them an extras sinister bite. Pseudogod's tone throughout Deathwomb Catechesis is one of abject misery and hatred. Saturnalia (The Night of The Return) seems to drag you further into their blackened abyss. There are some great guitar harmonies nestling in the song though, but it might take your repeated listens to truly appreciate them. With Azazel, Pseudogod seems to inherit a slightly more industrial sound, certainly in the opening bars anyway. When they hit top gear, that sound seems to disappear and is replaced by their more familiar blackened hue. The brooding guitar solo during Azazel adds mystery and a touch of real instrumental flair to the record and is one of the outstanding moments for me. The Antichrist Victory passes by in a whirlwind of growls and low-end rumble, with some pretty cool structure to boot. Pseudogod then fling themselves straight into Necromancy of The Iron Darkness, which is almost a battle stomp. You can just imagine soldiers marching to the front line, which this blasts in the background. The sound of menacing victory and fear all rolled into one! Pseudogod stretch their legs with their last two songs. Encarnacion Del Mal is pure blackened-thrash fest. It leads nicely into The Triangular Phosphorescence, which is nearly eight minutes of writhing pain. As with previous tracks, there is a seamless switch between the last two songs, so as not to lose the band momentum. The Triangular Phosphorescence is a slower song all round, borrowing some tempos and atmosphere from doom metal along the way. Overall, Pseudogod has done well with their debut album. I feel that the production does let it down slightly but then again, no black metal album should sound like a pop album! There's plenty here for fans of black and death metal to get their teeth into for sure. ZOM - Multiversal Holocaust 7"
Dead Church/Suffering Mind - Split 5"